Jenny and Holly commence agents blitz. ROYAL CARIBBEAN’S TEAM IRELAND HIT THE ROAD ON CARIBBEAN THEMED AGENCY BLITZ. 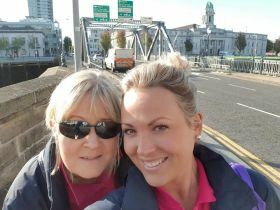 Royal Caribbean International’s Ireland team hit the road last week, with the team visiting trade partners across the island of Ireland for a three-day Caribbean-themed agency blitz that will see one agent win an incredible holiday. Jennifer Callister (Head of Royal Caribbean Ireland) alongside Holly Wilkinson (Account Executive) kicked off the Caribbean themed blitz in Cork on Monday 24th September, followed by visits to Dublin on Tuesday and Belfast on Wednesday. The team invited trade partners into the world of Royal Caribbean’s Perfect Day at CocoCay – a $200 million transformation of Royal Caribbean’s existing private island in The Bahamas – and is running a social media competition to offer one lucky trade partner the chance to win an extraordinary Royal Caribbean cruise for two, including a visit to CocoCay.